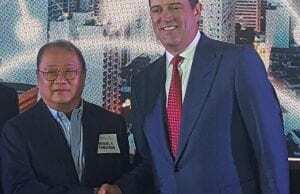 The Department of Information and Communications Technology (DICT) is expanding its common tower provider partners to five as it signed up two foreign companies while another one is set to join the list shortly. Photo shows Ted Manvitz, executive vice president and chief strategy officer of Nigerian firm IHS Towers (left), with DICT acting secretary Eliseo M. Rio Jr.
Nigeria’s IHS Towers and Malaysia’s Edotco Group signed a Memorandum of Understanding with the DICT on Thursday, January 17, while China Energy Engineering Group is set to ink the same deal on Friday, January 18. “This goes to show the confidence of the (tower provider) industry in the direction we are heading right now, which is to introduce more competition in the market,” DICT acting secretary Eliseo M. Rio Jr. said. with DICT acting secretary Eliseo M. Rio Jr. The common tower policy is also seen to aid the new major player – Mislatel consortium — in its roll-out plan to quickly compete with the incumbent telcos once it starts operating.